Konstantin Vialov (1900-1976) was born in Moscow and studied textile design at the Stroganov School for Technical Drawing from 1914-1917. After the revolution, he continued his studies at the newly formed State Free Art Studios (GSKhM) and the state-run art and technical school VKhUTEMAS. Among his teachers at GSKhM and VKhUTEMAS were Vassily Kandinsky, Vladimir Tatlin, David Shterenberg, and Aristarkh Lentulov. In 1925, Vialov became one of the founding members of OST (Society of Studio Artists), a group founded by VKhUTEMAS students who had studied in Shterenberg’s workshop and, according to the Metropolitan Museum of Art, “one of the most original but least explored phenomena of twentieth-century Russian art” (Russian and Soviet Painting: An Exhibition from the Museums of the USSR, 1977). His wife, the painter Elena Konstantinova Melnikova, was also a member. 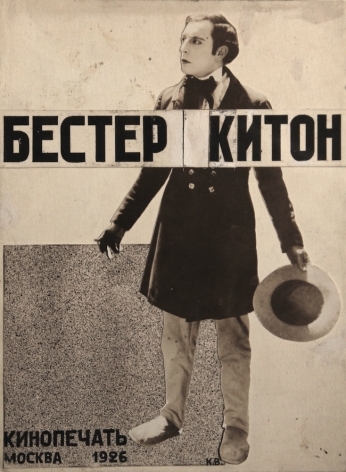 Vialov’s extraordinary output as an artist included Constructivist sculptures, abstract paintings, theatrical sets, and book illustrations, as well as covers for the theatrical weekly New Spectator, the film magazine Kino-Front, and the popular film library Kinopechat, for which he produced his famous collage of American comic actor Buster Keaton. 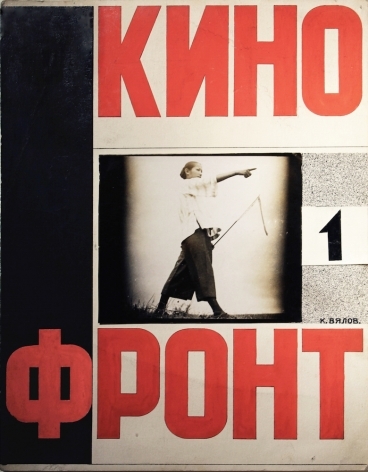 He produced the poster for Dziga Vertov’s film A Sixth Part of the World (1926), and the cover for one of Alisa Rozenbaum’s first books, Hollywood: American Cinema City (1926), published before she changed her name to Ayn Rand. Vialov began to exhibit his work as early as 1923, when he participated in the show Art of Moscow Theatre: 1918-1923 in Moscow. In 1925, he participated in the Paris International Exhibition with Kandinsky, Mayakovsky, and Varvara Stepanova. 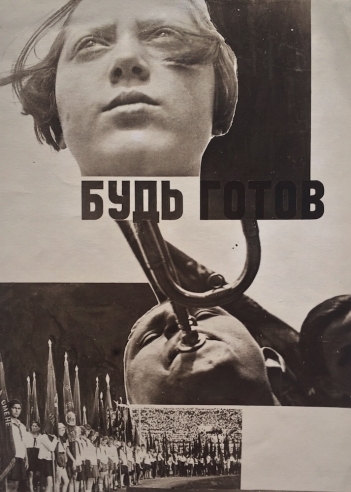 In the late 1920s, he showed his work in Leipzig, Berlin, and New York, and was included in a major exhibition in Moscow marking the tenth anniversary of the Revolution. His work was shown at the 1932 Venice Biennale, as well as at the Russian Museum’s jubilee exhibition Artists of the RSFSR Over 15 Years the same year. The following year, his work was included in the exhibition 15 Years of the Red Army in Moscow. 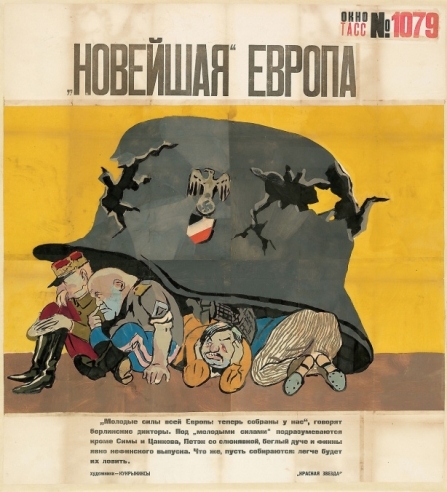 During World War II, Vialov produced series of posters for the Soviet central news agency TASS, which were exhibited at the Art Institute of Chicago in 2011 as part of the exhibition Windows on the War: Soviet TASS Posters at Home and Abroad, 1941–1945. After the war, he continued working as a painter until his death in Moscow in 1976. Today, Vialov’s work can be found in the collections of the State Tretyakov Gallery, the Russian Museum, and the Museum Ludwig in Cologne, among other institutions. In 1992, he was the subject of a solo exhibition at the Institute for Modern Russian Culture at the University of Southern California, titled A Glimpse of Tomorrow: Konstantin Vialov: Paintings and Drawings of the 1930s. His designs were included in the exhibition Building the Revolution: Soviet Art and Architecutre 1915-35 at the Royal Academy of Arts in London in 2011.